Candlelight always benefits from nearby crystal and silver to create a lot of sparkle, and we’ve designed our exclusive Stardust tealight holder to do just that. Seven silver mirrored tealight cups float between two pieces of glass that are surrounded by a frame of sparkly clear crystals and beveled mirror. 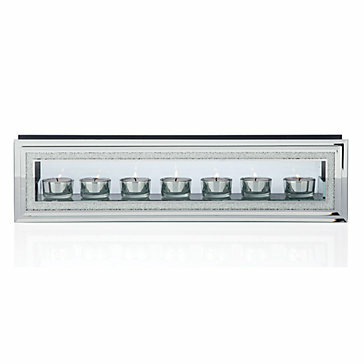 Holds seven standard tealight candles. (not included). Comes packaged in a box, ideal for gift giving. [value] => I was stunned by the quality and beauty of this tealight holder. It was perfect to enhance my holiday decorations, but I love it so much that I'll be using it the rest of the year too. I have ordered several items from Zgallerie and have continued to be impressed with the quality of the items. I was stunned by the quality and beauty of this tealight holder. It was perfect to enhance my holiday decorations, but I love it so much that I'll be using it the rest of the year too. I have ordered several items from Zgallerie and have continued to be impressed with the quality of the items.